Seven hundred and ten. That is the number of slaves counted in the 1860 Federal Census for Catoosa County (GA). As one can imagine, there have not been too many histories published about this single northwest Georgia county. What little histories there are, make little to no mention about the seven hundred and ten slaves counted among the 5,082 county residents in 1860. As someone who grew up in Ringgold, the county seat of Catoosa, I remember little to no history of slavery in the country ever being mentioned. There are no markers nor are there any memorial days designated to recognize those unknown persons; at least to my knowledge. I know that is not uncommon for the entire South but for Catoosa County, this is something I wish to rectify. Hence, my new project. I want to attempt to paint of picture of what slavery looked like in Catoosa from its inception in 1853 to slavery’s demise in 1865.As far as I know, there are only four histories of Catoosa County. The first published in 1953 is Susie Blaylock McDaniel’s Official History of Catoosa County, Georgia, 1853-1953. I only recently bought this book from the Catoosa County Historical Society so I’ve yet to really dive into it. Given the date of its publication, I suspect that there won’t be a lot of useful information regarding slavery in the county. I’ll definitely retract that statement if I find otherwise. In 1972, William Henry Harrison Clark followed McDaniel with his History in Catoosa County. Clark’s book is an ok public history. It attempts to chronicle the events of the county in the context of national history. It does mention the amount of slaves and even gives at least one account of slavery in the county. The issue with that is that there is no interpretation or analysis of the account. There is not any analysis of how slavery was intertwined with the county’s economy or what role slavery played in Catoosa’s support of the Confederacy during the Civil War. Clark followed up this publication with a volume II in the 1990s. This book offers readers an anthology of letters, memoirs, and papers that came to light after the publication of Clark’s former book. It includes another account slavery but again, no analysis. Don’t get me wrong, I’m not putting down Clark or McDaniel’s works. They are trailblazers in the history of the country and the only people to have made solid attempts at uncovering that history thus far. That last known history of the county is Jeff O’Bryant’s A Brief History of Catoosa County: Up into the Hills. This book seems to have been written primarily to make money. It is a shorter book, it flows fairly easily, and it includes a lot of pictures. However, it adds absolutely nothing new on the county and even gets some things wrong. For some reason, O’Bryant states that there were only 358 slaves in 1860. I can only assume he got that number by counting only the number of female slaves. This makes me wonder if he glanced at another source on the county’s census information from 1860; most likely one that gave the number of male and female slaves. Regardless, it is sloppy history. If O’Bryant had consulted primary sources he likely could have avoided that blunder. Part of my interest in this topic is the desire to make resources available to the public for study. Much of the information regarding the history of slavery in Catoosa County is tucked away in old property deeds buried beneath the county courthouse or hidden in the depths of the internet. I am going to attempt to digitize and re-record the information online as to make the information easily accessible. I am happy to report that I have already mined the 1860 Federal Census Slave Schedule for Catoosa County. I re-recorded the information into a spreadsheet and published that information to the internet here. You’ll notice at the top that there are three tabs that grant access to three different sheets. One reason I felt it important to re-record information such as this, is because it makes searching through the source much easier. A simple “CTRL + F” will bring up the find feature. Type in the word “Yates” and you will be directed straight to that surname. Another reason I put the information into a spreadsheet is because it grants me the ability to graph and chart slavery in Catoosa County. For example did you know that 15.2% of Catoosa County’s families in 1860 owned slaves? Or that 70% of Catoosa County’s slaves were twenty years old or younger? Needless to say, I’m finding this new project pretty interesting and it is very rewarding thus far. My eventual goal is to continue to develop this into a much larger county history. I plan to present my findings at different conferences in the hopes to get good feedback from people who have done similar research. Hopefully, this might lead to a march larger attempt at major publication. family diaries or anything. There are Hambrights buried in Dogwood Valley Cemetery, near Whitfield County. Kris, thanks for that. I’m going to cross reference a lot of these names with the regular federal census to see if I can make out the name better. Some of this old cursive is brutal. I’m soon going to upload images of the actual census pages from which the spreadsheet was derived. I double checked “Humbright” and I think you are most certainly right. I need to cross reference it with one or two more sources for confirmation. Thank you. I have not read McDaniel’s 1953 history, or Clark’s Vol II follow-up, but I found Clark’s original book fascinating and it’s still one of my favorites in my collection. I think my wife bought me a copy of O’Bryant’s book on a lark a year or so ago. My reaction to it was similar to yours; Short, easy to read, and serviceable, but like you, I found very little new information there that I was not previously aware of. In any case, good luck with your research! Vol. II of Clark’s book, like I mentioned, is really more of a library in and of itself. It has some new accounts that came to light. It also includes Kieth Bohannon’s paper on the Battle of Ringgold Gap which is quite stellar. Definitely worth the flip through. I volunteer to read any part of this project. Three things came to mind: 1) Might the relatives of these families object to making it public that their ancestors were slave owners? If so, anything they could do to stop this project? 2) ancestry.com 3) awesome. Some family members might object, sure. No, there isn’t anything they can do to stop the project. The information, such as the census records, are already public domain. People can already access it if they know where to look. Do you have a figure on what the average number of slaves held by a slave-holding family was in Catoosa County? 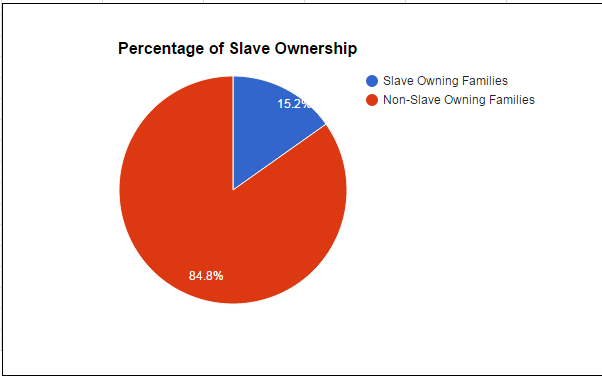 Was there a handful of large slaveholders, or were there many households that had smaller numbers of slaves? I’ve not visited Catoosa County so I don’t know if the location would have lent itself more to large plantations or smaller operations. That’s a great question. There is a formula somewhere to calculate the type of cells on the spreadsheet, I just have not found it yet. On a preliminary count that I did the other night, I could not find a owner with more than 25 or so slaves. That is a figure I am going to work on this weekend though. It shouldn’t take too long. What’s going to take awhile is examining how slavery grew in Catoosa from 1850 to 1860. Because Catoosa County did not exist in until 1853, I’ve got to go back to the 1850 census to the two counties from which Catoosa was derived (Walker and Murray). Then I’ll have to match up names from the 1860 census to those censuses. Should be…fun.